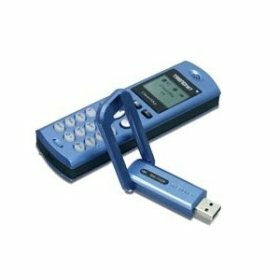 TRENDnet ClearSky Bluetooth VoiP Phone Kit (for Skype) is wireless handset accessory that uses Bluetooth to communicate with a PC. If your computer isn’t already Bluetooth enabled, you will need to plug in the bundled Bluetooth USB adapter. ClearSky streamline Skype calling procedures by taking advantage of Skype features such as Contacts, Call List, SkypeOut, and Conference Call. The Wireless VoIP headset features Bluetooth v2.0 Specification with EDR (Enhanced Data Rate) support, built-in voice communication support for Skype, MSN Messenger, Yahoo Messenger and more plus long-range support for up to 100 meters. ComputerAct!ve (dead link) reviews TRENDnet ClearSky Bluetooth VoiP Internet Telephony Kit and concludes with overall rating of 3 out of 5 that Skype devotees will find the ClearSky undoubtedly appealing. However, those who just make the occasional call should probably save their money and stick to using a headset. Good point is make and receive Skype calls wirelessly, while bad points are expensive, average call quality and PC must be on. Tech Digest concludes that It costs £78.99 here so you’ll be paying a bit of a premium for the Bluetooth, but it is the only one on the market with a decent range. If you’ve got a number of Bluetooth enabled pieces of kit, AND use Skype a lot, AND tend to keep your computer on, go for it.